Here at www.shopcookware.ie we supply a large range of Delonghi Kitchen Appliances through our www.shopcookware.ie website. The renowned Italian designers with a reputation for perfection have produced another in a series of master pieces. Enter the DeLonghi Cafe Treviso Espresso Coffee Maker which provides only the most flavour filled coffee to the discerning palette. The DeLonghi brand is synonymous with expertise and high quality design, providing the home owner with an excellent product guaranteed to make your guests clamour for more. 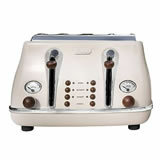 Formed by the De'Longhi family in 1902, the company originally produced industrial parts from the manufacturing plant. It could well be for this very reason that their tradition of master craftsmanship was first established and they have continued in this vein ever since. From small portable heating systems, their popularity saw them expand into almost every other form of household appliance. Their superiority in the industry has always been based on their flawless reputation for craftsmanship and technological expertise. Their Italian designs are feted for not only their mechanical functionality but also for their stunning aesthetics. The DeLonghi Cafe Treviso is a clear example of this with its modern appearance and silver on black scheme. Still based in Treviso in Italy, which is near Venice, the company remains a family business and, as such, is well placed to understand the needs of its appliance based market. 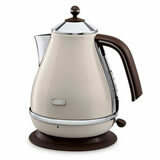 DeLonghi is known for developing new solutions to old problems. They cater directly to the needs of consumers without ever veering from their path of individual perfection in each and every item produced. Running 13 manufacturing facilities and 30 international subsidiaries, the brand provides quality household products to around 75 countries across the globe. Trading of this scope requires more than simply facilities, it requires a reputation for reliability and this - the Italian designers have in spades. Make the choice for affordable quality today when you order your own DeLonghi Cafe Treviso Espresso Coffee Maker.